Calling all men who love women! Are you man enough to take a stand against sexual and domestic violence? Are you man enough to walk a mile in a woman's shoes to prove it? 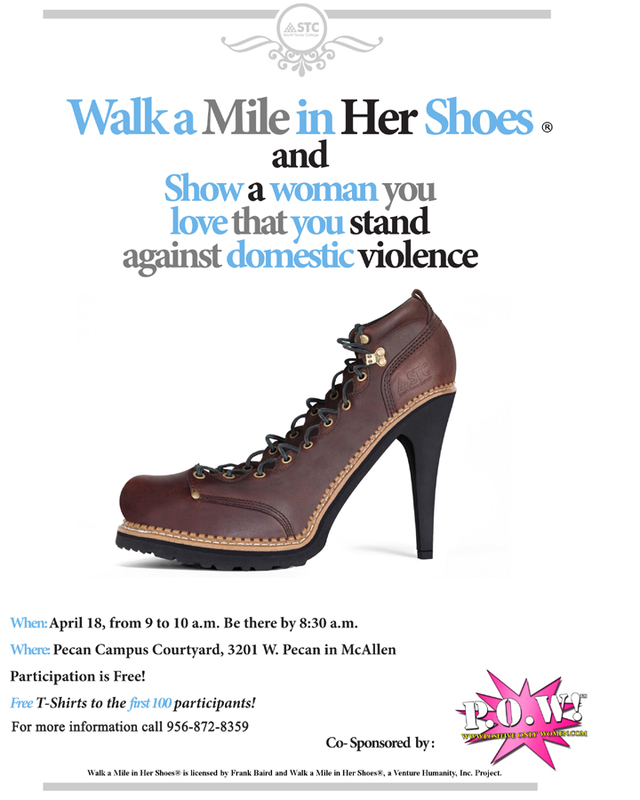 If so, show your support for the women who support you every day by participating in South Texas College's Walk a Mile in Her Shoes® Annual Walk on Wednesday, April 18, 2012 at 9 a.m. at STC's Pecan Campus Student Activities Building Courtyard located at 3201 West Pecan Blvd. in McAllen. Admission is free and open to the public. STC, in partnership with its community sponsor Positive Only Women (POW), is hosting this annual one-mile walk as a unique way to let Valley men show solidarity with women in ending sexual and domestic violence. Participation is free for any willing participant. 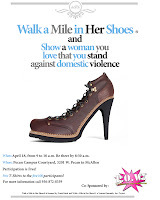 All participants are encouraged to walk a pre-determined one-mile walk across campus in women's shoes. The first 100 participants will receive a free tee-shirt and be treated to refreshments upon completion of the walk. "We are very excited to participate in this year's event," said POW co-founder Giselle Mascarenhas-Villarreal. "It is especially important to me and my POW sisters, who are focused on female empowerment. We hope to empower women to make needed changes in their lives and inspire our Valley men to make a difference by being good role models to their peers and for future generations." The walk is part of a national movement, which has spurred similar walks in major cities across the country. Millions of men across the United States participated in walks held throughout 2011. "This event is meant to help men understand that until you have literally walked a mile in shoes that you normally wouldn't fill, you can't possibly understand a different perspective on an issue like sexual or domestic violence," said Armando Ponce, STC coordinator of student activities. "Although men are sometimes victims, women and children make up the bulk of the statistics. So if this event shows even one student or community member that they are not alone or helps them change bad patterns, then it's been a success." For more information about the event and how you or your organization can participate call 956-872-8359. For additional information about Positive Only Women contact Giselle Mascarenhas-Villarreal at 956-393-1692. For more information on the national Walk a Mile in Her Shoes® movement visit www.walkamileinhershoes.org. Walk a Mile in Her Shoes® is licensed by Frank Baird and Walk a Mile in Her Shoes®, a Venture Humanity, Inc. Project.